The Latest in Surveillance, Full High Definition 1080p SDI CCTV Systems. 8 Camera High Definition Real Time Recording with over 1000TVL Resolution. Long Range Nightvision Cameras. What is the difference between HD-SDI 1080p System and Standard CCTV System with High Resolution 700TVL Cameras And D1 Recording Quality? One HD-SDI Camera with 1080p Resolution is capable of covering area over 6 times larger than 700TVL Camera with D1 Recording Quality with the same level of details. Look below. Complete Eyemax HD SDI CCTV System. HD SDI is a latest technology based on Serial Digital Interface. This standard allows Fully Digital uncompressed video signal to be sent from the cameras to the DVR using standard Caoxial cable RG6 or RG59. Since the signal is digital, there is no quality loss and it is possible to send Full High Definition 1080p quality picture over the distance up to 350ft. For longer runs we recommend purchasing signal repeater. 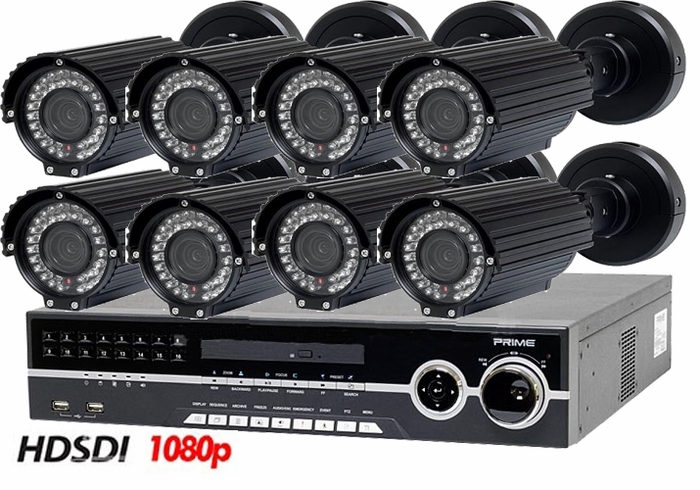 8 Channel DVR model included with this package can be also upgraded to 16 Channel. In case you may need to add more cameras in the future. Just use drop-down menu above to upgrade DVR model. Our pre-designed HD-SDI packages can be also simply customized to match your specific needs. This system allows customer to select from several different camera models. You can find a short description of every camera available for this package below. Click on the specific camera for more information. Use drop-down menus above to customize this package, change camera models, hard drive size and other options. Basic Package includes 500Ft High Quality Siamese Cable, Connectors and Professional Power Supply. You can purchase more cables using drop-down menu above.